The aim of our work was to define a possible role of adrenaline in the process of “mitochondrial biogenesis”. Mitochondria, the powerhouse of the cells, use oxygen as the last acceptor of electrons in their electron chain transport, the last step of oxidation of energetic substrates, to obtain the metabolic energy. Moreover, they are “plastic” organelles, able to adapt to the changes in body metabolic requests, by modifications of the content of electron transporters per mitochondrion and/or of the number of mitochondria for a cell. Therefore, when the metabolic requests increase mitochondrial biogenesis take place. The induction of mitochondrial biogenesis involves the transcription of the components of the mitochondrial electron chain which are codified by both the nuclear (most of which) and mitochondrial (some of which) DNA. Fig. 1. Adrenaline and reserpine effects on rat liver. The process is mainly controlled by a coactivator, the peroxisomal proliferator-activated receptor-γ coactivator (PGC-1) which in turn regulates the factors involved in the transcription of nuclear (respiratory factors 1 and 2, NRF1 and NRF2) and mitochondrial genes. Thyroid hormones are the main regulator of body metabolism. In previous researches, we observed that in the rats the same increase in serum level of thyroid hormones obtained administering the hormone (experimental hyperthyroidism) or exposing them to cold (functional hyperthyroidism) elicited different effects on mitochondrial proliferation in the liver. In both conditions, we found increased tissue oxygen consumption (respiration). In experimental hyperthyroidism, the increased respiration was due to the increased capacity of mitochondria to use oxygen but the mitochondrial content in mg of mitochondrial proteins per gram of tissue was unchanged. Conversely, in functional hyperthyroidism, the increased respiration was due to the increased mass of mitochondrial protein per gram of tissue, but the mitochondrial respiratory capacities were unchanged. This suggested us that another factor should have to be involved in the mitochondrial proliferation. One of the differences between experimental and functional hyperthyroidism is the plasma level of adrenaline that increases in cold -exposed rats but not in thyroid hormone -treated animals. Therefore, to test the adrenaline role in mitochondrial proliferation we evaluated the effects of adrenaline administration and its depletion by reserpine. We found that adrenaline treatment increased mitochondrial protein content per gram of tissue and reserpine reduced it. These effects were associated with similar changes in the tissue levels of PGC-1, NRF1 and NRF2, confirming the role of PGC-1 as regulator of mitochondrial biogenesis. It was suggested that PGC-1 activation can be up-regulated by reactive oxygen species (ROS). ROS are by- products of the normal metabolism produced by several cellular sources, even if mitochondria are considered the main because they use most of the cellular oxygen. ROS are highly reactive and can oxidize lipid and proteins if their content increase or the cellular protection against their action, the antioxidant system, fails. 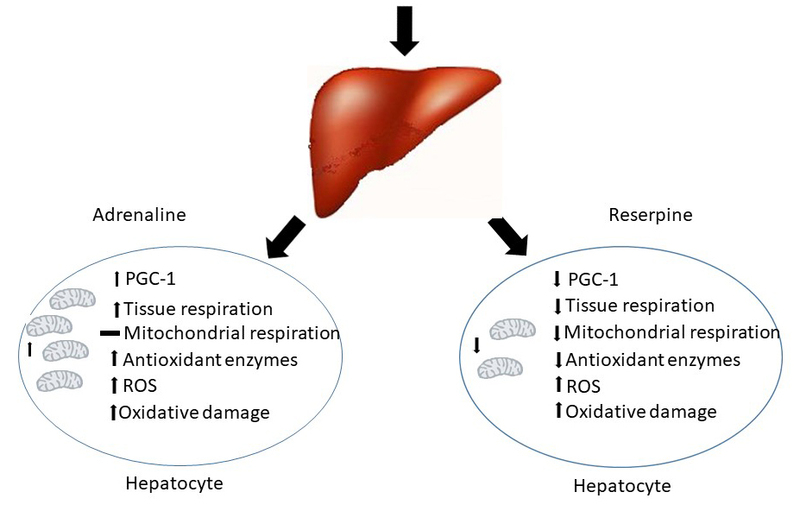 In our work we found that in both adrenaline and reserpine treated animals, both oxidative damage and mitochondrial ROS release increase, this suggests that in reserpine-treated animals the increase in ROS release was not able to increase PGC-1 levels. Moreover, only in adrenaline treated animals the increased oxidative damage was associated to the increase in the activities of two antioxidant enzymes, glutathione peroxidase, and reductase, confirming the role of PGC-1 as a regulator of the transcription of antioxidant enzymes. In conclusion, the results reported in our paper support the idea that the changes in mitochondrial protein content found in cold-exposed animals require the activation of multiple signalling pathways which impinge on PGC-1 and that adrenaline can play a role in such a process perhaps triggering the fission process. Adrenaline induces mitochondrial biogenesis in rat liver.